One of the great true Hollywood stars has died. Although Newman’s film appearances were rare the last couple of decades… the body of work, the iconic roles he left behind is impressive. Here’s a clip from my favorite Newman movie, Martin Ritt’s Cool Hand Luke (1967). Now… if you’ll excuse me, I’ve got a parking meter to vandalize and 50 hardboiled eggs to gulp down. He was Black Moses. Truck Turner. The Duke of New York. Chef. I don’t know what to say. It’s just sad, sad, sad news. Isaac Hayes is dead at the age of 65. Anyway, here are three clips honoring the great man. 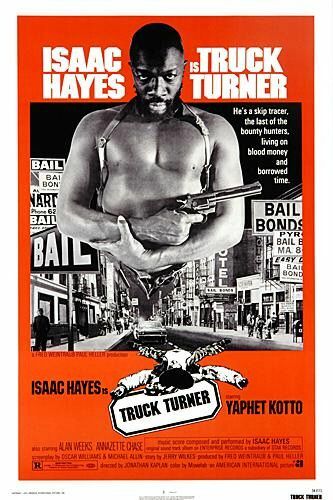 The first one is one of my favorite scenes from Jonathan Kaplan’s 1974 “blaxploitation” film Truck Turner. The second one is from John Carpenter’s 1981 film Escape from New York, showing Isaac as the Duke of NY entering the film in supreme style. And the third is the song “Hyperbolicsyllabicsesquedalymistic” from the album Hot Buttered Soul. Charlton Heston is dead. At the time that Heston made The Omega Man in 1971 (featured in the clip above), the notorious conservative actor (who was still a card carrying member of the Democratic party at that point but a Nixon supporter) probably did feel like the last man on earth. Surrounded by counterculture Hollywood, a relic of the studio system and more a practitioner of a relentlessly old fashioned theatrical style than a Brando, Heston still loomed large over the decade of decline. It was a credit to his adaptation that he managed to survive in an industry that doesn’t always reward change. I mourn his loss because as a youth growing up in the 1970s, he was my first real movie star idol, the first real impression I had of what an actor was. He also starred in one of my favorite films of all time, Planet of the Apes (and its sequel Beneath the Planet of the Apes), and to a lesser degree The Omega Man. As with the Planet of the Apes films, I loved Omega Man as a kid, then went many years without seeing it, in which I romanticized and misremembered it. When I finally saw it again in my early twenties, I was disappointed. It was far more campy and shoddy than I remembered it being, and unlike Planet of the Apes, lacked wit or imaginative bravado. But in its own misshapen way, I’ve come around and now love Omega Man and watch it at least once a year. Heston’s post-Apes roles in the 1970s are remarkable for the sheer number of times he suffered beatings and death at the hands of apocalyptic maniacs. I enjoyed, and still do, the Heston of the Epics (The Ten Commandments, Ben-Hur, El Cid, The War Lord) or the Westerns (The Big Country, Major Dundee, Will Penny, Heston’s favorite role). And then there was his role as a Mexican cop in Orson Welles’ Touch of Evil, arguably the last of the original American film noir cycle. It takes awhile to adjust to Heston’s casting as Vargas, but without him in the lead the film with Welles at the helm would have probably never happened. As the story goes, Universal Pictures wanted Heston to appear as the star of the picture. But when the actor heard that Welles was only attached to the film as an actor, Heston recommended him to direct as well. It was a gigantic risk for the studio considering that Welles was virtually blacklisted in Hollywood due to pressure from William Randolph Hearst, the FBI, and a series of box office disappointments leading up to his exile in Europe from 1947 to 1956 where Welles conjured up new avenues of magic–though hardly anything Hollywood would want to touch. There’s a scene in Tim Burton’s otherwise fine Ed Wood in which the “world’s worst director” meets America’s best in a dark lounge. Welles, played by Vincent D’Onofrio, remarks to Wood (Johnny Depp) that he’s just been saddled with Charlton Heston to play a Mexican at Universal. It’s a funny moment, but there’s no way the real Welles would have said it considering the actor had just given him the chance to direct in Tinseltown again. Apocalypse Heston. Disaster-mode Chuck. The slightly paranoid, cynical, volcanic Heston from the 1970s: that was the actor for me. Clint Eastwood, another early movie star idol for me, was meaner, tougher, and cooler. But for me, Heston was the quintessential Hollywood action star: masculine, intelligent, versatile, and absurdly charismatic. His portrayals of larger than life heroes was always tinged with a humanity and vulnerability that I don’t think many of the action stars that followed, e.g. Stallone or Schwarzenegger, were ever able to match. He was also the consummate professional and a gentleman from all accounts. You don’t last in the business for as long as Heston did without mastering the art of good manners. It’s sad that for many, younger, film fans, Heston will be remembered for his “hammy” acting or as president of the NRA, conservative activist (though I find it amusing that so many of his detractors conveniently ignore Heston’s liberal past and his civil rights involvement) , or as the elderly Alzheimer-afflicted scapegoat in Michael Moore’s 2002 documentary Bowling for Columbine, where the intrepid filmmaker/gadfly bum rushes the ailing actor in his own home. I’m no apologist for Heston’s political beliefs. No doubt, I’d have more in common with Moore’s politics. But the scene is disgusting and a cheap shot. Regardless of personal beliefs, I know who I’d rather have dinner with. Below are two more favorite clips from his dystopian science fiction period: the finales of Planet of the Apes and Soylent Green, the latter an aesthetic predecessor to Ridley Scott’s 1982 classic Blade Runner. You can also go here, here, and here for some rather wonderful and eloquent pieces on this true colossus of Hollywood.